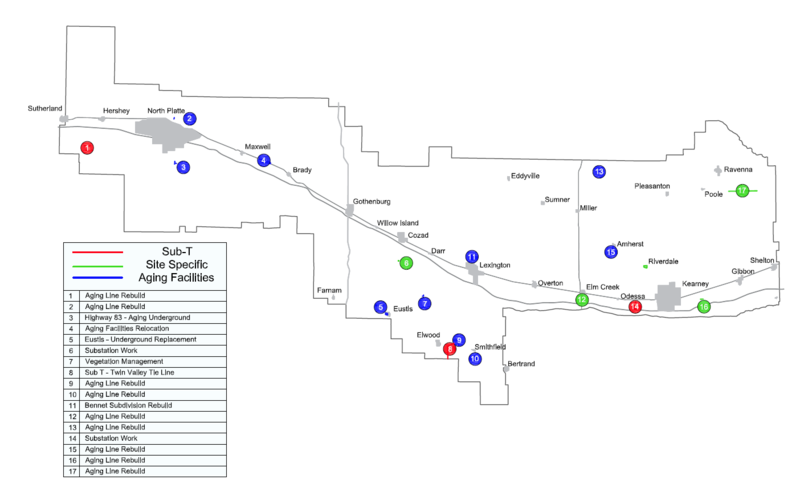 The 2019 Dawson PPD Work Plan includes over $3.8 million in projects within the District’s territory. Over $3.8 million in system improvements are scheduled for construction in 2019. Compared to the past eight years, this budget is lower than the average budget of $8.2 million. Please see the General Manager’s column for details. As a not-for-profit utility, Dawson PPD budgets to reinvest in its system annually to ensure safe and reliable electricity. The budget was approved at the December board meeting. Project funding is derived from previous annual sales and long-term bonds. All projects are evaluated on safety, reliability and system loading. These power lines carry electricity to customer homes, farms and businesses. Aging distribution describes power lines that have been in place for more than 50 years, including original equipment from the early 1940s. These lines are in need of complete replacement to ensure safety and reliability. Between 20 to 30 miles are budgeted to be replaced each year. These power lines are located on the side of the road and provide power to homes, farms and businesses. The plans include projects scheduled as part of a multi-year plan and divides large projects into smaller, more manageable parts. The third category represents Dawson PPD’s need to increase its capacity for power at substations and on distribution and transmission lines. Transmission lines carry power between substations. A substation is a point where electricity is sent into the distribution system so it can be delivered to customers.